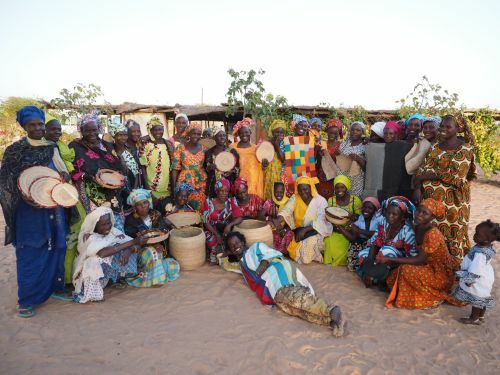 In 1985, the Ndem Villagers Association was set up as a dynamic community collective to try and improve living conditions for rural populations and halt the mass rural depopulation in the Sahelian region of Senegal. Taking a holistic approach, the organisation utilises permaculture, agroecology and a strong sense of community co-operation. Its achievements so far include an agro-ecological garden and farm, an artisan centre, a health centre, and a ‘Yaakaar’ production unit (an alternative to coal). It has also established the Biofarms Senegal project in partnership with SOL Alternatives Agroécologiques et Solidaires. The project works across environmental, social, economic and cultural aspects of regeneration through: using agroecology and seed saving to improve biodiversity and soil health; changing how agricultural work is viewed; creating income-generating activities; and upgrading the historic Nguiguiss Bamba site. Now an NGO, Association des Villageois de Ndem has become a key player in the social, economic and environmental regeneration in the region and has been able to reverse the dynamics of rural depopulation.